On Friday, 21 July 2017 Master Robert Woodthorpe-Browne’s fourth market visit was at the Baltic Exchange. The Baltic is world’s oldest shipping market which is a membership organisation for the maritime industry and freight market information provider for the trading and settlement of physical and derivative contracts. 23 World Traders including their guests were lead into the Board Room (already beautifully laid for our lunch), supposed to be the best room in the House. Mr Robin King, Head of Marketing, was our speaker. Founded in 1744 as Virginia and Baltick Coffee House and now owned by Singapore exchange, the exchange has gone through many changes over the years. In 1800 set up as subscription run set up; in 1900 Exchange Floor opened; 1992 the building bombed by the IRA; 1995 moved to new offices. With advancement in communications, trading floor was closed for face to face business in 2002. The motto of the Exchange –‘ Our word our bond’ symbolising the Baltic Code where Ethics and market practices are essential is run on set rules . A large part of the world’s maritime cargo chartering and sale and purchase business is negotiated at some stage by members the Baltic. Baltic publishes numerous daily indices (Baltic Freight index set up in 1985) which indicate the state of markets as well as providing guidance to the brokers which form the price mechanism in the freight futures market. 40% of International Maritime business is done through the Baltic Exchange. The membership today is made up of Corporate members, individuals and expert witnesses totalling to about 3000. They come to the Baltic Exchange to access membership and meet the Brokers. Those of us familiar to the International trade were fascinated to learn more about shipping from Mr Robin King who delivered an excellent talk. 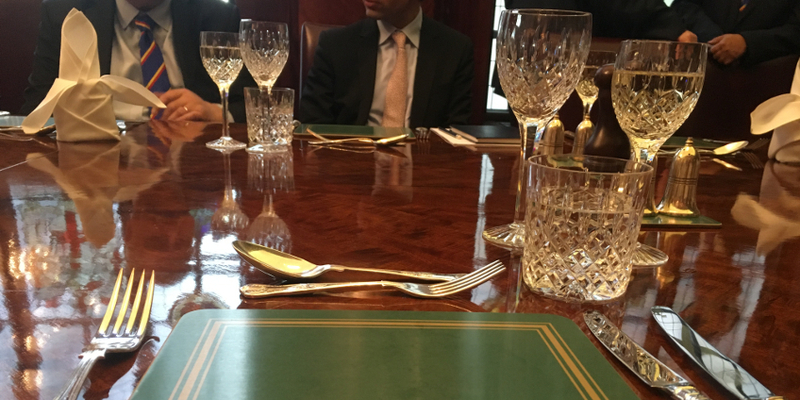 After the talk we had an excellent lunch in the same Board Room – a perfect start to the week end.